The greyhound is situated at the top end of Belper on Whitemoor lane. The pub was recently refurbished in 2014 to a high standard offering facilities for all, wether you fancy popping in for a quick drink and a game of pool to a romantic meal for two or a birthday celebration here we have it all. A spacious beer garden to the rear boasting an enclosed Haven for children and dogs alike, perfect for those hot summer days and long summer nights with a refreshing drink in hand. We have a great selection of cask marque approved real ales and fridges bursting with a selection of wines, bottled beer/ciders and not forgetting a vast range of soft drinks. We pride ourselves on high quality locally sourced home cooked food to produce our fantastic menu catering especially well for vegan, vegetarian and gluten free. Here at the greyhound we are well known for hosting events and family occasions, we have a large 80 seater restaurant that we can transform for birthday parties, wedding receptions, anniversary parties and wakes. If you would like to organise and event of family occasion please contact us. 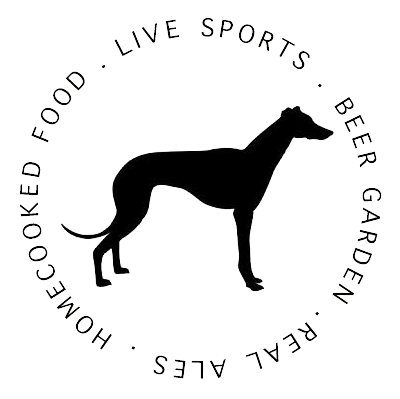 We have been at the greyhound since 2009 and we look forward to serving he community for many years to come while striving to make every visit to the greyhound as enjoyable as we can. Pop down and say hello we are always thrilled to welcome new customers. Before you order your food, please speak to our staff if you have a food allergy or intolerance. *All weights quoted are approximate, prior to cooking. Some fish dishes may contain bones. All dishes are subject to availability. All prices include VAT. Wholetail may contain one or more tails. All photography is for guidance only. Whilst we take every care to preserve the integrity of our vegetarian products, we must advise that these products are handled in a multi-use kitchen environment. GF – can be made to be Gluten Free, please speak to a member of staff. Sat 20th Apr @ 12:30 PM Manchester City v Tottenham Hotspur (Premier League) Title-chasing Manchester City host Tottenham Hotspur at the Etihad Stadium in the Premier League. City can move back to the top of the table with a win ahead of Liverpool's game tomorrow. Sat 20th Apr @ 5:30 PM Newcastle United v Southampton (Premier League) Newcastle United and Southampton look to boost their Premier League survival hopes as they square-off at St. James' Park. Sun 21st Apr @ 1:30 PM Everton v Manchester United (Premier League) Everton play host to Manchester United at Goodison Park in the Premier League. Sun 21st Apr @ 4 PM Cardiff City v Liverpool (Premier League) A crucial match at both ends of the table as Cardiff City take on Liverpool at Cardiff City Stadium in the Premier League. Mon 22nd Apr @ 8 PM Chelsea v Burnley (Premier League) Chelsea face Burnley at Stamford Bridge in Monday Night Football from the Premier League. The Blues need a win as they chase down a top-four finish.